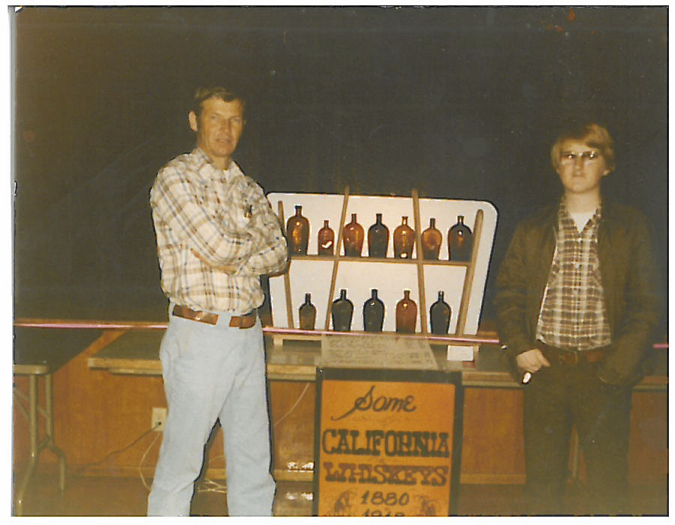 American Bottle Auctions grading goes by a number system, which coincides with the condition of a bottle. When you read a description, we will talk about the condition of the bottle in detail and then assign a grade number to it. For instance, it might say, “this bottle has some light stain and some minor high-point wear and grades an 8.” This number reflects the things we talk about and any flaws or distractions from a bottle being perfect. The condition number falls between a 1 and a 10, with a grade 10 Attic Mint being the best. A grade number can fall in between such as an 8.5 or sometimes we will say 9.3, and you can generally go by the grade number as being in the neighborhood of what condition we feel this bottle falls under. We will have a minimum of three experts examining each bottle in this sale. We will examine every bottle under 10-30X magnification and in bright indoor and outdoor light. You can take two bottles, both grading a Mint 9 but one might have loads of whittle and a great color while the other is a rather plain aqua with no whittle. While we take into account the whittle and color in the estimated value, the grade would be a Mint 9 for both bottles. A bottle may be in perfect condition but have a weak strike or no whittle. Some bottles just don’t come with whittle or rarely stray from the same color. A slightly chipped bottle can have tons of whittle and a great strike but the chip really hurts it. In only the rarest and most desirable of bottles does a bit of damage not affect the value a great deal. The bottle can be professionally repaired, but in some circles repairing a bottle does just that, mark it as a repaired bottle. A small ding or flake doesn’t bother some collectors and some cringe at the thought. In addition, some people are searching out those slightly damaged or repaired bottles as they can be had for less and often you can’t tell the difference from a perfect example. Provenance is another factor that can affect the value of a bottle. Was it in the collection of the late Charles Gardner? Even a bottle previously owned by a well-known active collector can increase the value. The grade assigned does not take whittle or crudity, provenance, rare colors or variant rarity into account. The grade is only dependent on the condition of the bottle. We will talk about condition, color, crudity, and special features like a drippy top or evidence of extreme crudity, but it all comes down to stain, scratches, small chips or large chips to determine a grade. Essentially the grade is the degree from what a perfect 10 bottle would be. We take a bottle, start out with a grade 10 and subtract from there depending on the particular flaws to that piece. How can a bottle with a chip be Mint? Well it isn’t but instead of us saying a bottle is a grade 3 because of the chip or other major problems like a crack, we will occasionally grade the bottle without the chip or crack and then say for instance, a grade 9.4 with large chip. Without the chip the same bottle would simply be called Mint 9.4. We do this as we believe it’s up to the buyer to determine the “degree of hurt” the chip causes. Just because we don’t think it’s that bad, some people would consider it a catastrophe. It’s rare that a bottle has it all and you can expect to pay more, sometimes much more than the regular book value or “going rate” of a typical Near Mint bottle when bidding on a Mint example. We suggest you read the overall description, then use the grade number and check out the streaming video and pictures to make a decision when bidding on a bottle. The computer is much more informative when making a decision. We will discuss as many factors as possible in determining the grade. Very poor condition, scratches, small flakes off the glass, a fair amount of stain; not a great bottle. 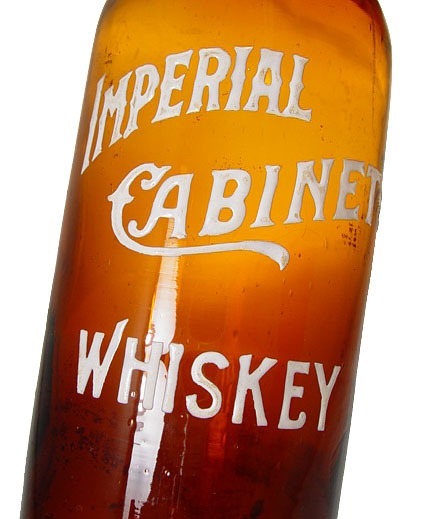 We rarely sell a bottle in this condition except when they are rare and or have historical or great monetary value. There’s an Average condition grade 5 and an Average grade 2. The difference could be pretty dramatic. An Average grade 5 could be a fairly decent bottle but will certainly have some problems. Sometimes if a bottle is extremely rare, a grade 5 might be the best you’ll find. A decent condition bottle. Probably a couple scratches, a pinhead-sized ding on the base and maybe some minor stain, it is visibly pleasing at first glance but not a great bottle. It could be a bottle that should or could be cleaned to improve it, and we’ll mention that on occasion. Good grade bottles are generally decent bottles that might have a very small chip, crack or radiating potstone. 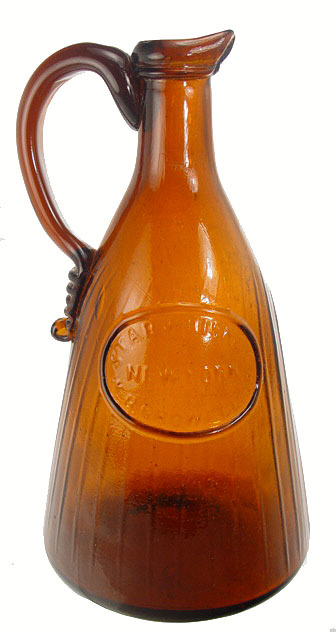 Please note that some bottles, like soda or beer, tend to be in lesser grades due to the amount of original use they had. At first glance, the bottle appears Near or Almost Mint. Upon closer examination there may be some scratches, some minor stain or small flaw including a miniscule flake or an in-making radiating potstone the size of a pinhead. 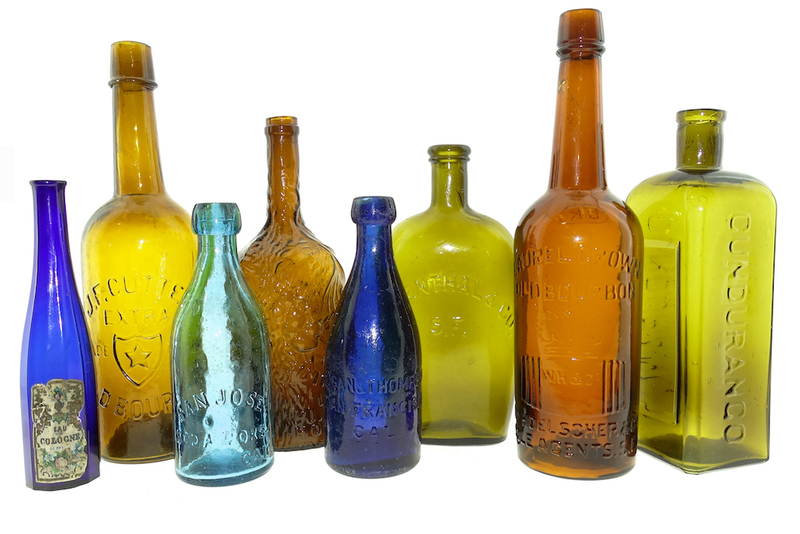 Near Mint bottles can exhibit wear and can have some typical light scratches or minor highpoint wear. A Near Mint bottle is a good condition bottle that could be cleaned. As we say, Near Mint can fall in between categories. There might be a pretty significant difference between a Near Mint 8.1 and an 8.9. A great looking bottle, no real flaws. At first glance it appears as an Attic Mint bottle. A Mint bottle can possibly have just the most minor scratch or just a bit of wear. A number of bottles we sell are Mint bottles primarily because that’s what our customers are looking for. Most Mint bottles should be considered top specimens. Rare bottles in this condition are usually quickly bought up and often the only question is the price. Once again, there could be a decent amount of difference between a 9.1 and a 9.8 grade Mint bottle, but you’re talking small differences in a super condition bottle. Both are generally perfect but one might have an impeccable pristine look while another isn’t quite as striking. Small areas of wear, a few very light scratches that are difficult to see can also be called a Mint bottle. A small area of stain, a bit of wear, a light scratch, either way, a Mint bottle is a great condition bottle. Perfect, no cleaning, possibly found in an attic. Possible original label. Undisturbed by time. We almost never call a bottle Attic Mint unless it’s been found in a house or somehow protected by the elements. 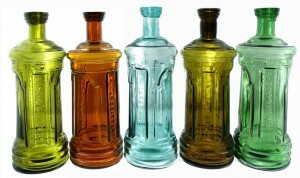 Attic Mint bottles are usually an absolute top specimen strictly regarding condition. In other words, two bottles that could be considered Attic Mint could vary in crudity and color but as far as condition, they would both be considered equally Attic Mint. You can go into a supermarket today and find a brand new bottle that isn’t Attic Mint. They are a very special condition bottle and very difficult to find.